John Bacon died between 14 Aug 1450 and 29 Jul 1451. He married Anne Unknown. She died after 1450. William Bacon probably died shortly before 4 Apr 1492. He married Isabel Unknown. She died after 1492. Thomas Bacon was born in 1475. He between 31 Jul 1534 and 28 Feb 1535. He married Joane Unknown. She died between 30 Jul 1540 and 12 Dec 1540. Robert Bacon died after 1492. Thomas Bacon was born in 1475. [Ref] He died between 31 Jul 1534 and 28 Feb 1535. He married Joane Unknown. [Ref] She died between 30 Jul 1540 and 12 Dec 1540. Joane signed her will on 30 Jul 1540; it was proved on 12 Dec 1540. She mentions her daughters Elizabeth Bacon and Anne Dow. [Ref, p. 14] Perhaps Anne is a married daughter or perhaps she is a daughter from a previous marriage. John Bacon was born about 1505. He died between 7 Sep 1557 and 19 Mar 1557/8. He married Margaret Unknown. She died after 7 Sep 1557 and by 1574. Elizabeth Bacon died after 30 Jul 1540. John Bacon was born about 1505. [Ref] He died between 7 Sep 1557 and 19 Mar 1557/8. He married Margaret Unknown. [Ref, p. 14] Margaret died after 7 Sep 1557 and by 1574, when William disposed of Ashbocking in his will. William had a daughter Rose who married John Ballet. They had a daughter Rose Ballet. Richard Bacon was born after 1536. He died after 1574, when he is mentioned in his brother (the younger) William's will. Richard had a son Michael. Barbara Bacon was born after 1536. She died after 7 Sep 1557, when she was mentioned in her father's will, and probably before 1574, when her brother (the younger) William did not mention her in his will. Rose Bacon was born after 1536. She died after 1574, when she is mentioned in her brother (the younger) William's will. Michael Bacon was born about 1535. He was buried on 25 Mar 1615. He married first Elizabeth Wylie on 16 Aug 1565 in Helmingham. [Ref, p. 16] She died before 20 Sep 1607. Michael and Elizabeth were baptised as adults on 31 May 1566, along with their eldest son. [Ref, p. 17] Michael married second Grace Blowerses on 20 Sep 1607 [Ref, p. 17] in Winston [Ref says that she was a widow]. John Bacon was baptised on 31 May 1566. [Ref, p. 17] He died after 20 Apr 1615, when he proved his father's will. He had children named John, Michael and Elizabeth. Thomas Bacon was living on 24 Oct 1614. Michael Bacon was baptised on 6 Dec 1579 in Winston. He died on 18 Apr 1648 in Dedham. He married Alice Unknown. Elizabeth Bacon was baptised on 3 Sep 1584. [Ref, p. 17] She and her husband died before 24 Oct 1614, when Elizabeth's father wrote his will. They left a daughter named Katherine. Michael Bacon, the immigrant, was baptised on 6 Dec 1579 in Winston. [Ref, p. 125] He died on 18 Apr 1648 in Dedham. [Ref, p. 26] He married Alice Unknown. She died on 2 Apr 1648 in Dedham. [Ref, p. 25-26] There was a small pox epidemic in the Massachusetts Bay Colony in 1648. It appears that Michael's daughter Alice died on 29 March of small pox, followed by her mother on 2 April and then Michael on 18 April. Michael Bacon of Dedham signed his will on 14 (2) 1648. He left his oldest son Michael "one tipped pot (torn) silver spoons" [that his father left to him], his "stuffe coate" and stockings; he left his second son Daniel his best "kowe", his best steer, an iron kettle, three pewter dishes of middle sort in value, his best coat and his wife's best gown; he left his third son John upland called "the twelve Acre Lott", meadows and swamps, his best feather bed except one, bed clothes, a pot and a trammel; he left his daughter Sarah Bacon his tenement, where he dwelled, and land, cattle, swine and household goods. He left his son-in-law Thomas Bancroft 20 shillings. He will was proved on 26 (2) 1649 and inventory was taken on 20 (2) 1649; his estate was valued at £54.15.04. [Ref][Ref, p. 27-28] The silver pot and spoons are important in identifying Michael of Winston as the father of Michael of Dedham. some descendants of Michael Bacon. Daniel Bacon was born about 1615. He died on 7 Sep 1691 in Newton. He married Mary Reed. According to Baldwin [Ref, p. 114], Daniel died young. Thomas Bacon was born on 13 Apr 1645 in Cambridge (now Newton). [Ref] He died young. [Ref, p. 114] He is not the Thomas of Roxbury who married Mary Unknown. See the comment by F. L. Beller. Jacob Bacon was born on 2 Jun 1654. He died in 1709 in Newton. He married Elizabeth Knight. Dea. John Bacon was born on 27 Feb 1682/3 in Watertown. He died on 19 Feb 1740 in Canterbury. He married first Marcy Foster. 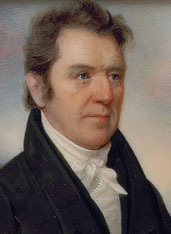 He married second Hannah (Adams) Perkins. Ruhumah Bacon was born on 8 Apr 1686 in Cambridge (later Newton). She married Benjamin Crehore. Mary Bacon was born on 2 Feb 1689 in Newton. She was living and unmarried on 22 May 1713. John Bacon married Marcy Foster [Ref] on 23 May 1710 in Norwich. [Ref][Ref, p. 124] She died, presumably in childbirth, a few days after her third son was born on 9 Mar 1716 in Norwich. [Ref][Ref, p. 124] John married second Hannah (Adams) Perkins, the widow of John Perkins, on 25 Dec 1716 in Norwich. [Ref, p. 124-5][Ref says Job Perkins][Ref] Hannah was the daughter of Richard Adams. [Ref, p. 124] Hannah was a member of the Canterbury revivalists in 1745 (See Canterbury and the Awakening, above). Lieut. John Bacon was born on 28 or 29 Apr 1711 in Norwich. He died on 2 Oct 1790 in Canterbury. He married Ruth Spaulding. Jacob Bacon was born on 20 Apr 1714 in Norwich. [Ref][Ref, p. 126] He died before 3 Jun 1789, when his father's estate was settled. He may be the Jacob who married Priscilla Richmond on 1 May 1748 in Sharon, Litchfield, Connecticut. [Ref] Priscilla, the wife of Jacob, died on 22 Jan 1746/7 in Sharon. [Ref] Either the wedding date is an error or Jacob had two wifes named Priscilla. 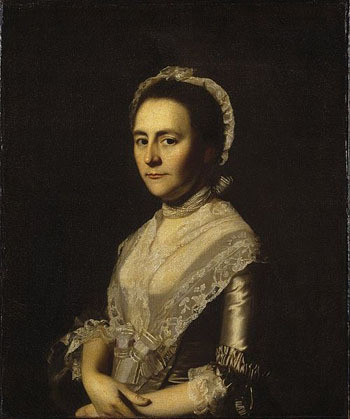 Mary Bacon was born on 30 Jan 1720/1. She was baptised on 26 Feb 1721. She died on 15 Jan 1793 and is buried in the Cleaveland Cemetery in Canterbury. [Ref] She married Timothy Backus, Jr. on 14 Nov 1739 in Canterbury. [Ref] Timothy, the son of Timothy and Sarah (Post) Backus, was born on 18 Nov 1717 in Canterbury. [Ref] He was baptised on 2 Feb 1718 in the Congregational Church in Canterbury. [Ref, p. 52] Capt. Timothy Backus died on 5 Mar 1790 and is buried in the Cleaveland Cemetery. [Ref] Click here to see a photo of his grave. Capt. Asa Bacon was born on 21 Nov 1735. He was baptised on 29 Mar 1736. He died on 15 Oct 1819. He married first Edith Bradford. He married second Abigail Whitney. Olive Bacon was born on 24 Jun 1747. Asa Bacon's (and later is son Asa's) house was recently on the market. The realtor's description was: "Today, this 3600+ sq. ft., 4 bedroom home heralds itself to be the best detailed and most well-preserved of Canterburys late 18th century houses. Influenced by the more formal Georgian design, it embodies several distinctive features including a magnificent foyer, graced between two chimneys, eight fireplaces, and a bee-hive oven. The double dentillated moldings, wainscoting and detailed cabinetry is phenomenal. An intriguing basement and a walk up attic, which might be expandable finished space, looks to be in outstanding condition." Asa has two headstones in the Hyde cemetery. Click here to see them. They say: "Revolutionary War/Col Chester's Co./Died October 15, 1819/AE 84" and "This is the grave of/Asa Bacon Esq/Who died/October 15, 1819, Age 84". John Bacon was born on 24 Nov 1774 in Canterbury. He died on 16 Jan 1846. [Ref][Ref] He is buried in the Hyde Cemetery in Canterbury. [Ref] Click here to see a photo of his grave. John kept the records for his family that are transcribed in Dumas (1984). His own death is entered in the records in pencil, in different hand writing. Amy Bacon was born on 13 Oct 1779. She died in Canterbury on 24 May 1816. She married Fitch Adams. Abbott, John H., "Correction and Addition," New York Genealogical and Biographical Record 48, 1917, p. 414. Allen, John Kermott, "Thomas Bancroft of Dedham and Reading, Mass. and Some of his Descendants," New England Historical and Genealogical Register 94, 1940, 215. Ancestry.com, New York, Death Newspaper Extracts, 1801-1890, (Barber Collection), database on-line, Provo, UT, Ancestry.com Operations Inc, 2005. Ancestry.com, Rhode Island Deaths, 1636-1930, on-line database, Provo, UT, Ancestry.com Operations Inc, 2000. Anderson, Robert Charles, "Ancestry of President Calvin Coolidge," The American Genealogist 53, 1977, 65-75, 160-170. Bacon, Eliza Buckingham, "Michael Bacon of Dedham: His Probable Ancestry," Notes and Queries Section, New England Historical and Genealogical Register 57, 1903, 329. Bacon, Leon Brooks, "Michael Bacon and his Descendants," New England Historical and Genealogical Register 56, 1902, 364. Errata: 57, 1903, 223. Baldwin, Thomas Williams, Bacon Genealogy: Michael Bacon of Dedham, 1640 and his descendants, Cambridge, Mass, unknown, 1915. Bartlett, J. Gardner, "Bacon Family of Helmingham and Winston County, Suffolk, England and Dedham and Salem, Mass.," Notes Section, New England Historical and Genealogical Register 90, 1936, 300. Bureau of the Census, Third Census of the United States, 1810, Washington, DC, National Archives and Records Administration, 1810. M252, 71 rolls. Online: Ancestry.com, Provo, UT, The Generations Network, Inc., 2004. Bureau of the Census, Sixth Census of the United States, 1840, Washington, DC, National Archives and Records Administration, 1840. M704, 580 rolls. Online: Ancestry.com, Provo, UT, The Generations Network, Inc., 2004. Bacon, Asa: Year: 1850; Census Place: Litchfield, Litchfield, Connecticut; Roll: M432_42; Page: 261A; Image: 518. Brandon, John C. and Jane Ireland Delorey, "The Puzzling Will of Rebecca Bacon," The American Genealogist 73, 1998, 23-32. Bridgman, Thomas, The Pilgrims of Boston and their Descendants: with an introduction, New York and Boston, D. Appleton and Co., Phillips, Sampson & Co., 1856. Cleveland, Edmund James, The Genealogy of the Cleveland and Cleaveland Families, Hartford, CT, Printed for the subscribers by the Case, Lockwood & Brainard Co., 1899. Cooke, Rollin Hillyer, Historic Homes and Institutions and Genealogical and Personal Memoirs of Berkshire County, Massachusetts, New York, Lewis Pub. Co., 1906. Cutter, William Richard, Genealogical and Personal Memoirs Relating to the Families of the State of Massachusetts, Lewis Historical Publishing Company, New York, 1910. Dexter, Franklin Bowditch, Biographical Sketches of the Graduates of Yale College: with annals of the college history, Vol. I, New York, H. Holt and Co., 1885-1912. Online: Ancestry.com. Find a Grave Website, http://www.findagrave.com. Hale Collection, Connecticut Cemeteries, Windham County, CT USGenWeb Project. Hanson, Robert Brand, ed., Vital Records of Dedham, Massachusetts, 1635-1845, Camden, ME, Picton Press, c. 1997. Available as: Dedham, MA: Vital Records 1635-1845, New England Historic Genealogical Society. Hayward, Kendall, "Richard Adams of Sudbury, Mass. ; Plainfield and Norwich, Conn.," The American Genealogist 23, 1946, 141-149, Addenda 24, 1948, 193. Hill, Don Gleason, ed., The Records of Baptisms, Marriages and Deaths, and Admissions to the Church and Dismissals Therein, transcribed from the church records in the town of Dedham, Massachusetts, 1638 - 1845, Dedham, unknown, 1888, available at the New England Historic Genealogical Society. History of Connecticut Manufacturing Company, Windham County Genealogy and History Website, www.connecticutgenealogy.com/windham/. The Iveagh (Phillipps) Suffolk Manuscripts, Suffolk Record Office, Ipswich Branch. Jacobus, Donald Lines, "The Spencer Borthers: Their ancestors and descendants," The American Genealogist 17, 1950. Jeffries, John W., "The Separation in the Canterbury Congregational Church: Religion, Family and Politics in a Connecticut Town," The New England Quarterly 52 (1979), 522-549. Jeffries, Walter Lloyd, "Town Rates of Newton and Billerica, Mass.," New England Historical and Genealogical Register 31, 1877, 302. Johnson, Edward F., Woburn Records of Births, Deaths, and Marriages From 1640 to 1873, Woburn, Andrews Cutler & Co., 1890. Lanard, Ellen D., History of Windham County, Connecticut, Vol. 1-2, Worcester, MA, USA, 1880. No Author, Biographical Directory of the American Congress, 1774-1949: The Continental Congress September 5, 1774, to October 21, 1788 and The Congress of the United States From the First to the Eightieth Congress March 4, 1789 to January 3, 1949, Inclusive, Washington, D.C.: United States Government Printing Office, 1950. Odiorne, James C., "A Complete List of the Ministers of Boston of All Denominations from 1630 to 1842, Arranged in Order of Their Settlement," New England Historical and Genealogical Register 1;134-136. Paige, Lucius R., "List of Freemen," New England Historical and Genealogical Register, 3, 1849, 347-8. Paige, Lucius R., "Middlesex Statistics. 1680," New England Historical and Genealogical Register 5, 1851, 171. Perry, Arthur Latham, Williamstown and Williams College: a history, unknown, The author, 1904, c1899. Records of the Congregational Church in Canterbury Connecticut 1711-1844, published jointly by the Connecticut Historical Society and the Society of Mayflower Descendants of in the State of Connecticut, Hartford, 1932. Sedgwick, Charles F., General History of the Town of Sharon, Litchfield County, Conn.: from its first settlement, Amenia, NY, C. Walsh, Printer and Publisher, 1877. Transcriptions of William Bacons's will and John Bacon's will, translated from Latin, were posted by Kathy Kuhnle on 1 May 2009 on: Ancestry.com. Public Member Stories [database on-line]. Provo, UT, USA: Ancestry.com Operations Inc, 2006. Trask, William, "Abstracts from the Earliest Wills on Record in the County of Suffolk, Mass.," New England Historical and Genealogical Register 7, 1853, 231. Trowbridge, Francis Bacon, The Champion Genealogy: a history of the descendants of Henry Champion of Saybrook and Lyme, Connecticut, together with some account of other families of the name, New Haven, F.B. Trowbridge, 1891. Vital Records of Norwich, CT 1659 - 1848, Robertson Family Genealogical Research Project. Vital Records of Watertown, 1630-1825. Online database: New England Historic Genealogical Society, 2007. Vital Records of Woburn, New England Historic and Genealogical Society. Vose, James Gardener, Commemorative Discourses Preached in the Beneficient Congregational Church, Providence, Rhode Island, Oct. 18, 1868, Providence, Beneficient Congregational Church, 1869. Walker, Edith Carey, daughter of Brig. Gen. Asa Bacon Carey, notes on her family. Winsor, Justin, ed., The Memorial History of Boston: including Suffolk County, Massachusetts, 1630-1880, Boston, James R. Osgood and Co., 1881-1883. W.S.A., "More Immigrants Traced," Notes and Queries Section, New England Historical and Genealogical Register 21, 1867, 369.